OXFORD, Miss. – Childhood obesity is a serious health problem, affecting 13.7 million American children and adolescents ages 2 to 19, according to data collected by the Centers for Disease Control and Prevention. Obesity puts children at risk for poor health and disproportionately affects Hispanic and African-American communities, the CDC has found. 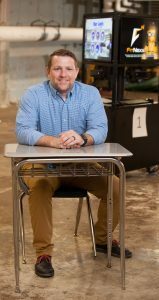 Webb Smith, who earned a doctorate in health and kinesiology from the University of Mississippi, is combating childhood obesity in the Mid-South with a new exercise technology, Fit4Class, designed specifically with kids in mind. Smith is an assistant professor in the Department of Pediatrics in the School of Medicine at the University of Tennessee Health Science Center. At Le Bonheur Children’s Hospital, UTHSC’s clinical partner, Smith is developing a new gaming system to improve children’s access and approach to exercise. The game system has been in development for three years and is not yet commercially available. It is being tested in a Shelby County, Tennessee, charter school. “Here in Shelby County and in the Memphis area, there are a large number of elementary schools who do not have a school gymnasium,” Smith said. “We have used this technology to actually have these interactive PE classes. Besides developing gaming systems that improve children’s access to exercise in schools, Smith is a founding provider in the Healthy Lifestyle Clinic, a pediatric obesity program at UTHSC. “I believe that exercise is medicine,” Smith said. “I believe in prescribing exercise just as you do with medication, where we monitor the dose and follow up on the dose. In addition to his gaming system research and development, Smith is studying a genetic variant that is more prevalent in African-Americans and dictates how a person’s body breaks down fatty acids. His other recent research includes lifestyle and metabolic syndrome in adult survivors of childhood cancer, effectiveness of home exercise during maintenance therapy for childhood acute lymphoblastic leukemia and emotional distress among survivors of childhood cancer. Smith credits part of his success in health care research to support he received from his UM mentor, Mark Loftin, associate dean of applied sciences and professor in the Department of Health, Exercise Science and Recreation Management. “Over my career, I have had the pleasure of serving as major professor for about 10 doctoral students,” Loftin said. “I would place Dr. Smith in the top 10 percent of that elite group. Besides his professional career, Smith is a dedicated husband and father of two young boys. Prospective students interested in the health and kinesiology doctoral program at Ole Miss should contact Minsoo Kang, department chair, at kang@olemiss.edu. The School of Applied Sciences, home of the Department of Health, Exercise Science and Recreation Management, offers professional preparation programs that integrate academic study, clinical training, creative research, service-learning and community outreach, leading to the development of leaders whose professional endeavors will improve health and well-being.